There are sculptures tucked away here and there aplenty in Dublin. 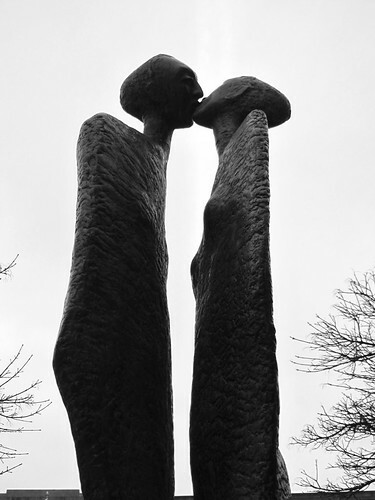 The Kiss is tucked away from unaware public eyes across the road from the National Concert Hall, where Earlsfort Terrace meets Hatch Street. A commission casted by Blackrock-based sculptor, Rowan Gillespie some two decades ago, this is my favourite among his many works. I’ve always been quite fascinated by the height and the elegance of the figures, closing in for a kiss but remains physically separated. Indeed, even the lips are not quite locked in yet, projecting a sense of longing and intimacy simultaneously. The bodies, untouching one another, makes me wonder if this is a moment of tentative reunion or a long goodbye; the figures putting a distance akin to holding an invisible shield to protect themselves from hurt. Quite a number of Gillespie’s other works can also be found around Dublin. Among those that I’ve seen for myself, they usually hold much emotion in gestures and body language that one cannot help but be moved by the mood projected. I’ll try to grab some shots of them in the next couple of weeks if I have time to venture over to the sites.